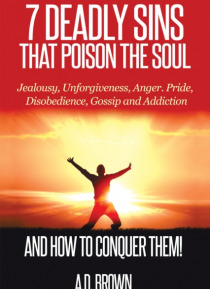 IHG® Rewards Club - eBook - 7 Deadly Sins That Poison the Soul and How to Conquer Them! Are you tired of living a life overcome by hurt and pain? Do you feel like youre stuck in a rut and tired of setbacks? What do you do while you are waiting on your breakthrough? Are you ready to take back your life and live the victorious life that Jesus Christ died to give you?7 Deadly Sins That Poison the Soul and How to Conquer Them is a tool to help readers overcome seven of lifes most difficu… lt challenges: jealousy, unforgivingness, anger, pride, disobedience, gossip, and addiction. This book will provide spiritual tools to help the hurting, equip the strong, enlighten the wise, nurture the insecure, and enhance spiritual growth through exploring the authors real-life experiences and learning what the Word of God has to say about the situation. Reading this book will encourage you to take back your life, unpoison your soul from the deception of the enemy, and live an abundant life. Romans 8:37 (NIV) says, No, in all these things we are more than conquerors!